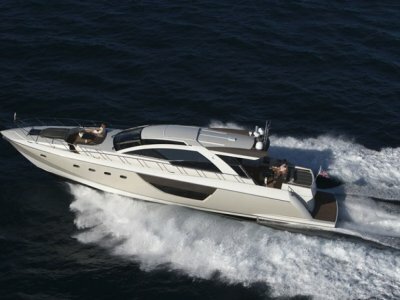 The Alpha 76 Flybridge is a yacht that the whole family will enjoy. A high performance hull by Michael Peters, a Louis deBasto fashioned interior and a century of boat building knowledge define a sports yacht that breaks new ground. The Alpha 76 is an advanced machine, able to rapidly consume miles of ocean in whatever form that comes. Focus however is never lost of the ultimate goal. Pleasure aboard for the owner, family and friends. Nestled within the Michael Peters hull is a sumptuously crafted interior conceived by Luis deBasto. Exquisite joinery, meticulous design and attention to detail define the interior that is executed to perfection by the craftsmen at Cheoy Lee. Comfortable accommodation for six adults and two is housed with the interior of the Alpha 76 Flybridge. The full beam master stateroom has large hull side windows, which extend through into the unsuited head and cedar lined wardrobe. These bright spaces with sea views are the perfect place to unwind. Two guest's staterooms, one to port and one forward, each offer island double berths and unsuited heads. Spacious staterooms and heads with abundant storage allow your guests to feel right at home. To starboard of the wood planked lower deck foyer, there is a day head and laundry room equipped with a washer dryer and fitted with linen storage lockers. Two crew can be accommodated aft, with separate access to their self-contained quarters from the aft deck. The galley, dining area, salon and lower helm station are cleverly laid out on the main deck to maximize available space. 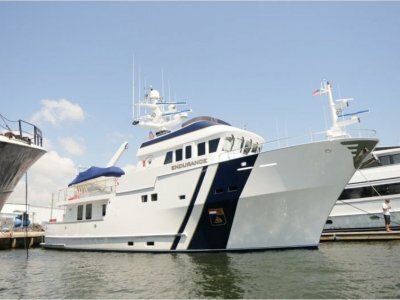 Located aft, the galley opens out to the aft deck via sliding glass doors. Centrally located the galley effectively serves the dining area, aft deck, flybridge and foredeck seating areas. Wide and comfortable stairs link the aft deck and the flybridge. 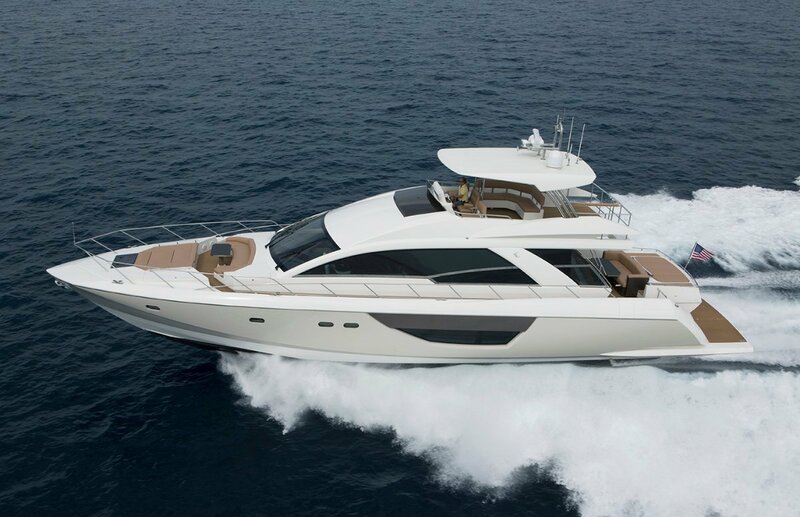 The flybridge is fitted with a double helm seat at the central control station, lounge seating and an inviting sun deck aft. The aft deck dining area and lounge sits immediately ahead of an island sun pad. Comfortable accommodation for six adults and two is housed with the interior of the Alpha 76 Flybridge. The full beam master stateroom has large hull side windows, which extend through into the unsuited head and cedar lined wardrobe. These bright spaces with sea views are the perfect place to unwind. Two guest's staterooms, one to port and one forward, each offer island double berths and unsuited heads. Spacious staterooms and heads with abundant storage allow your guests to feel right at home. The galley, dining area, salon and lower helm station are cleverly laid out on the main deck to maximize available space. 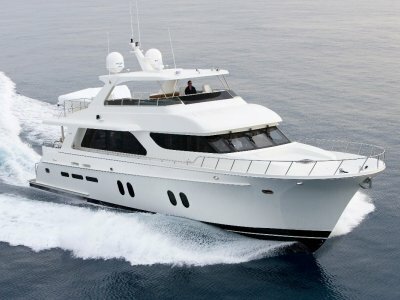 Located aft, the galley opens out to the aft deck via sliding glass doors. Centrally located the galley effectively serves the dining area, aft deck, flybridge and foredeck seating areas. To minimize vibration, Cheoy Lee builds the Alpha's interior on a floating framework, isolated from the hull and support members. Hull rigidity is increased by integrating tankage with the hull structure. 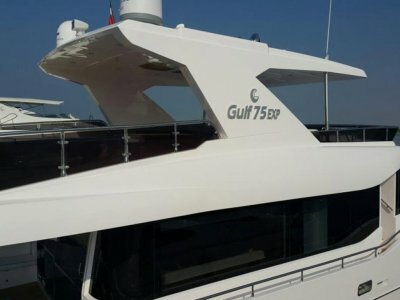 A feature of all Cheoy Lee yachts, where the resulting "double bottom" offers significant safety benefits, increases tank capacity, lowers centre of gravity and avoids corrosion associated with metal tanks.